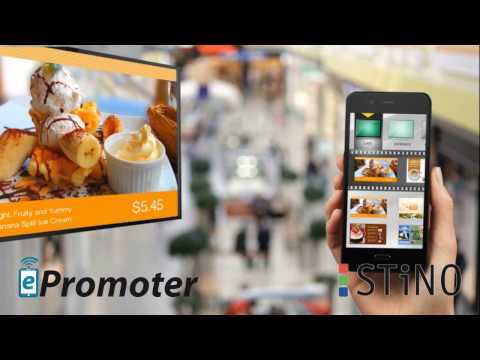 A leader in Digital Signage software for nearly two decades, STiNO has created the ultimate presentation software package for all Digital Signage multi-touch display applications. The touchPromoter software enables the clever creation of interactive presentations for multi-touch displays within a few minutes. A number of different Apps such as Swipe, Book Flip, Puzzle, Google Maps, Browser and others can be easily configured with STiNO’s touchPromoter Configurator tool which to give the maximum flexibility and customisation for every display presentation. The touchPromoter is a software package for multi-touch displays which runs on Windows 7/10. The software incorporates a variety of Apps with different gesture controls to allow businesses to present their content in the easiest way possible. The user simply selects the app they need to create the interactive presentation, such as the Swipe App (images, videos), Book Flip App (PDF, images, videos), Fly App (images videos), Puzzle App (images, videos), Table App (images, videos), Kiosk Browser App (Awesomium or IE Browser Engine) or Google Maps. The Apps can be easily configured with the touchPromoter Configurator tool. When the touchPromoter is loaded, the main menu shows the different apps with a scrolling news ticker on the bottom of the screen. For example, the Swipe App is used to move the content backwards and forwards across the screen with a swiping control and the Book Flip App, as the name suggests, allows you to flick through the content like the pages of a book using a finger. Selecting the Fly App will show the images and videos moving around on the screen and the user can touch to stop the image, move it around and resize it. These simple motions and gestures make the content even easier to navigate for users, increasing the interactive experience for the target audience. The touchPromoter software package is so quick and simple, organisations can create dynamic interactive presentations for multi-touch displays within a few minutes. The wide variety of Apps means the software can be used in virtually every industry sector as the content and gestures can be made applicable and relevant to each specific audience. The touchPromoter stand-alone presentation and kiosk software has an easy configurator tool and is highly customisable to suit all digital signage applications.